Tourism Himalayas representative pick up you from hotel at Delhi and transfer you to railway station to board train to Kathgodam. From Kathgodam, you will be driven to Nainital. Nainital is one of the most beautiful hill stations in Uttarakhand. It is very popular among honeymooners and nature lovers. On arrival at Nainital, check-in at your hotel. Freshen up and relax. Later, embark on sightseeing of Nainital. Enjoy boat ride on picturesque Naini Lake. Visit postcard-prefect picnic spots known for nature beauty – like Naina Peak, Snow View, Lands End, etc. In the evening, enjoy fabulous shopping. Dinner and overnight stay will be at the hotel. Have a very hearty breakfast at the hotel. Later enjoy exciting lake tour visiting some beautiful lakes in and around Nainital. Famous lakes are Bhimtal Lake, Naukuchiatal Lake, Sattal Lake, etc. Boating facilities are available at lakes. Later in the afternoon drive to Almora. On arrival at Almora, check-in at hotel. Take your breakfast at the hotel. 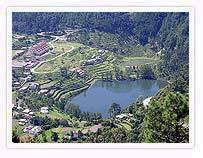 Later visit famous and beautiful spots of Almora hill station. Explore scenic landscapes and enjoy holiday activating with refreshing air at the landscapes which is extremely blessed with copious nature beauty. Enjoy shopping at Almora Mall Road. After hearty breakfast at the hotel, drive to the nearby spots from where you will get breathtaking views of majestic Himalayas. We take you to Lakhudiyar and Jageshwar. Here you will see many ancient temples and beautiful valleys surrounded by picturesque deodar tree. Spend rest of the day at leisure enjoying your holiday activities. Have a very hearty breakfast at the hotel. Drive to Kausani – one of the most beautiful places of Kumaon region in Uttarakhand. On arrival at Kausani, check-in at the hotel. Take your breakfast at the hotel. 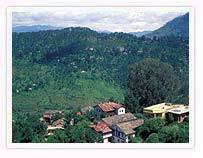 Enjoy sightseeing in and around Kumaon. Explore nature beauty and scenic landscapes. Spend rest of the day at leisure. Have your breakfast at the hotel. 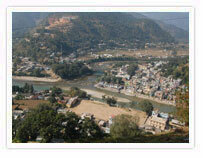 Drive to Bageshwar situated at the confluence of three rivers namely, Saryu, Gomati and Bhagirathi. Bageshwar is a picturesque hill station known for beautiful scenic spots and delightful climate. On arrival at Bageshwar, check-in at hotel. Later visit famous temples like Bagnath Temple and Chandrika Temple. Experience the beauty of Kumaon hills. After hearty breakfast at the hotel, take excursion trips to nearby places like Kanda, Vijaypur and Pandusthal. All these places are very popular among nature lovers. In the evening have a close look of Bageshwar and its culture by walking down in the small market. Take your breakfast at the hotel. In time you will be transferred to Kathgodam railway station from where you will be board train back to Delhi.